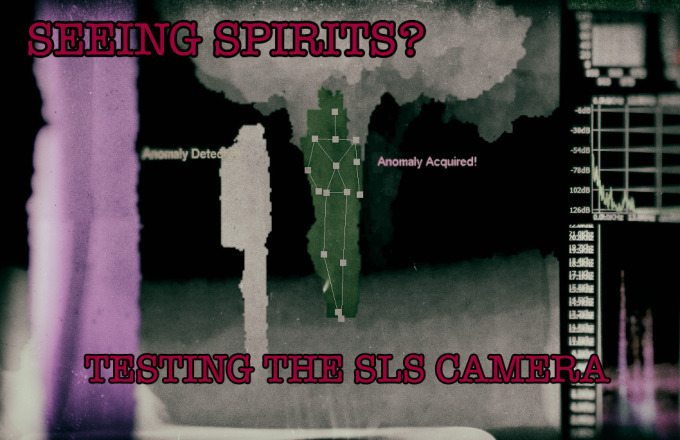 A few weeks ago I saw a digital dowsing product up for pre-order..the new SLS Camera system. A portable version of the one Bill Chappel built for Ghost Adventures. Many of you may have seen that GA episode where Bill was there with them testing out his kinect camera with software designed to sense handpick up spirits in the form of a stick figure. A Kinect style SLS camera has the ability to pick up our human bodies and track them in great detail. Many have found that using a kinect they were picking up stick figures at random, behind them or in their house when there was no one there with them. So quite a few Ghost Hunting enthusiasts gave it a try and there are a few videos on youtube with some interesting evidence. I was never a believer in it as I felt it was just latching onto something in a house or in the field and seeing it as a human, when it was not. But I was intrigued and seeing that I am so passionate about this field I decided to pre-order one at Ghost Outlet. They were running a special price of $275 off so I figured, WHY NOT? When it arrived I cracked it open, charged the battery and did some tests. My 1st real test blew me away. My 2nd test where I tried to debunk the 1st one made my jaw drop..my third test where the SLS not only picked up a figure in my office but also some amazing clear and loud EVP made me sort of freak out. I then took it to my bedroom and asked for a spirit to show up next to my bed and then on it..on command it happened. Yet, I was still skeptical that this could all be random chance..even though all of these things were happening on command. Finally, I took it out to a cemetery by myself late night. I filmed with it for 8 minutes and NOTHING was showing up..until I requested something VERY specific..then BAM, something appeared. Then I asked another question, BAM, it responded with my request. I did it again to see if it was a fluke and BAM, it responded again. I am not sure how this works or what is going on but if this is REALLY picking up spirits then it is something that we need to really look more into. I will be using it extensively on locations to attempt to get some more rock solid evidence and to rule out any kind of random chance. I do not think that every time this detects and anomaly that it is a spirit but I do feel that when they respond on command to specific requests that it most likely IS indeed something intelligent. Take a look at the video below and see all of my tests during the 1st five days of use.